Discover the unspoilt beauty, wild dramatic coastlines and crystalline waters of southwestern Sardinia - perfect for a cycle adventure. Ride past cliffs, bays and inviting beaches, discovering ancient abandoned mines and friendly local people. Explore Sant'Antioco and Carloforte islands and cycle along the stunning 'costa del sud' before spending our final night in lively Cagliari. The transfer from Cagliari Airport should take around 1.5hrs. Arrive and check into the agriturismo, our base for two nights located a few kilometres outside of Arbus town. Arbus is well known locally for the production of the l'Arburese knife and there is a museum in town dedicated to it for those interested. Alternatively you may just choose to relax at the agriturismo. After breakfast we spend some time getting comfortable with our bikes and making any necessary adjustments. The first ride starts with a panoramic road through a cork oak forest to Arbus. We'll stop in Arbus for a coffee or the chance to visit the knife museum. We continue cycling along a wild and scenic Mediterranean 'macchia' route, finally descending to the sea. Here a short deviation takes you to one of the most extended desert area of Europe - Piscinas beach. Later we cycle uphill through the almost abandoned mining village of Ingurtosu on our route back to Arbus (note that it is possible to request a van lift for final 4km steep section, thus avoiding 380metres of ascent). Our total cycling distance today is approximately 53 kilometres (1200 metres total accumulated ascent and descent). Today's ride starts with a long winding downhill to Portixeddu, one of the favourite spots for local surfers. After a break for some good coffee you start climbing to Buggerru, where the Tour Leader will explain about a system of tunnels that were used to transfer minerals from the mines to the port. We plan to visit the mines, reaching them on a short locomotive ride through the tunnel, then later returning on foot along a panoramic path. Back on the bike, further on we get some great views of the Pan di Zucchero (Sugar Loaf) cliff and the Masua mines. Our ride ends in the village of Nebida where we spend the night. Our total cycling distance today is approximately 40 kilometres (930 metres total accumulated ascent and 1220 metres descent). After breakfast we cycle for about 25 km to the port of Portovesme, where we take the ferry to the Island of San Pietro. Upon docking at Carloforte harbour you may soon start noticing the different accent the Carlofortini have - in fact they have Genoese roots and speak a different dialect from the rest of the Sardinians. It is here in the last week of May that Italy's last remaining 'tonnara' operates as a system of nets is used to catch the Tuna. They also have a culinary festival at the same time. After a short visit we take another ferry, this time to Calasetta, on Sant'Antioco Island - home to some excellent wines (from the local Carignano del Sulcis vine). The Sulcis region is known for the Carignano vine that can live with very little rainfall and is stunted by strong winds to no more than a foot high. Many local families still have a little vineyard to produce it and after a sip you know why they still make it! The last section of our ride is around 12km on the flat to Sant' Antioco town. There will be an optional visit to a small producer of Carignano for wine tasting. Our total cycling distance today is approximately 39 kilometres (400 metres total accumulated ascent and 540 metres descent). You can choose to kick back and relax today or take a cycle ride around the island. Our suggested route makes its way around the island, with stops at various inlets for a break or picnic. Other options include taking a fishing boat excursion or horse riding or just to relax on the beach. Our total cycling distance today is approximately 42 kilometres (480 metres total accumulated ascent and 460 metres descent) (optional). We ride back to the main island of Sardinia this morning. Leaving S. Antioco there is a section of about 2km where we have to ride on the busier main road before turning onto quieter secondary roads. The first stop on today's ride is at the village of Tratalias, with its Romanesque church dedicated to Santa Maria di Montserrat. After the village of Santadi, you pass by the stunning caves of Zuddas where you have the option to visit. Finally a ride along a quiet road leads you to Teulada, our final destination for today, famous for terracotta pipes and highly refined embroidery. Another tasting is included today to sample the excellent Sardinian wines. Our total cycling distance today is approximately 48 kilometres (550 metres total accumulated ascent and 500 metres descent). Our final ride is a must for cyclists! The Costa del Sud is an incessant repetition of ups and downs with breath-taking views over the coast and the sea, with occasional watchtowers and beautiful inlets. There are several places to stop and swim in the crystal clear water. All good things come to an end and our final stop is in the lively town of Pula. At a site close to town you have the option to visit the archaeological site of Nora - an important port in Phoenician times where it is possible to admire some very well preserved Roman mosaics. 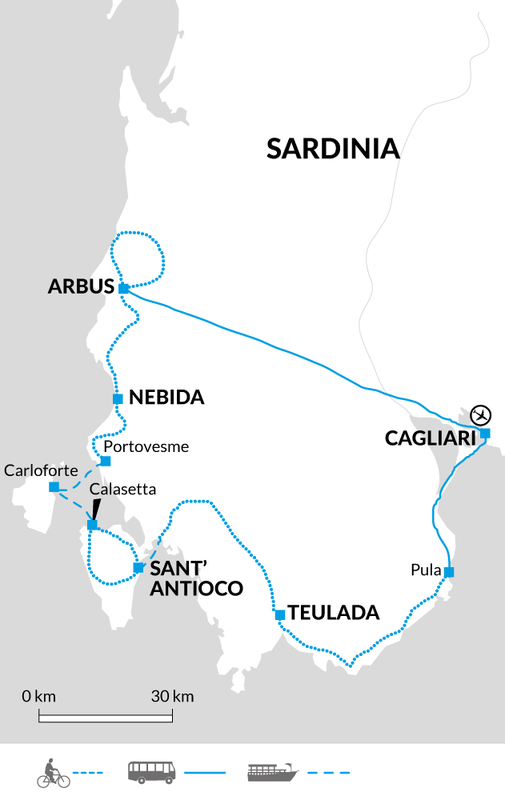 In the mid to late afternoon we drive in our charter vehicle from Pula to Cagliari and the journey takes around 1 hour. With such little time in this city you may choose to extend your stay beyond tonight. Our total cycling distance today is approximately 49 kilometres (630 metres total accumulated ascent and 670 metres descent). The tour ends in Cagliari this morning after breakfast. Although entirely voluntary, tipping is a recognised part of life in this region of the world. Some local staff will look to members of the group for personal recognition of particular services provided. In order to make things easier for you, the Explore Leaders may organise a group's tips kitty and if this is the case, they will account for it throughout the tour. On this tour we cycle 229 km over five days (an average of 44 km per day) with further optional rides available. We generally cycle on quiet tarmac roads and most of the rides are through hilly terrain with the steepest and most challenging climbs on days 2 and 3. The Explore Leader accompanies on bike each day and there is a support vehicle accompanying the rides on days 2 and 3. Maps and route notes are provided so you can choose to cycle individually or in groups. Your luggage is carried from point to point. We have graded the route as moderate. Your included bike is a 30 gear custom-built hybrid bike and will be the correct frame size for your height. A rear pannier is included and there is the facility to fit your own pedals or saddle if you wish to bring them. A support vehicle accompanies the rides on days 2 and 3. We provide spare parts and take care of the day to day maintenance. All you need to bring is your own helmet.